The West Virginia Legislature passed House Bill 2014, the Budget Bill, in just three days of an extended session. The $11.4 billion worth of appropriations in the budget bill was agreed to by the House of Delegates and state Senate quickly following the end of the 2013 Regular Session . Despite economic challenges the budget is balanced, as required by the state constitution and avoids any layoffs, furloughs or appropriations from rainy-day reserve funds. To meet this year’s budgetary challenges and the projected slowing of revenue collections, the Governor first asked for most state agencies to trim their Fiscal Year 2014 Budget requests by 7.5 percent from the current year. Certain agencies and programs deemed paramount to the health, safety and well being of the state were exempted from these cuts. Some exclusions from cuts include: Medicaid and other health care related programs, the Division of Corrections, the State Police, certain funding for public education, the Veterans’ Nursing Home, Miner’s Health, Safety and Training, the Aged and Disabled waiver program for Seniors, and any funds necessary for debt service or required contributions to benefit plans so as to keep the state current on its bills and retain solid financial footing. The agreed to budget includes approximately $4.1 billion in general tax revenues, which is nearly $14 million less than the general revenue spending plan adopted in the prior legislative session and more than $200 million or 2 percent less when all sources of revenue are counted. Further historical comparisons reveal that the budget just adopted is approximately $150 million less than the budget bill adopted four years ago. Of the $4.1 billion in General Revenue appropriations Public Education accounts for over 48 percent, Health and Human Resources requires 22.5 percent, and Higher Education and Military Affairs and Public Safety shares are 10.3 percent and 8.8 percent respectively. The compromise bill provides $45.6 million for a senior citizens medicaid waiver program that helps to keep our seniors in their own homes while ensuring that they receive the care they need. For each dollar put into this program the state draws approximately three dollars from the federal government. The state police’s share of the new budget includes $3 million meant to allow a new trooper cadet class. Proposed cuts in funding for domestic violence programs, and programs aimed at addressing child abuse have been restored to the prior years level and $125,000 has been included for anti-sexual assault efforts that had been eliminated in the Governor’s original proposal. Lawmakers ensured that college scholarship programs would be fully funded, with $37.5 million for PROMISE, $470,000 for engineering, science and technology scholarships and $200,000 for the Underwood-Smith program. Funding was also fully restored for the HSTA program. In keeping with it’s original intent to promote tourism, the lottery portion of the budget provide $2.5 million to more than 400 cultural events and programs around the state. These include county fairs, local festivals, Fourth of July celebrations, theaters and museums. Other spending spelled out in the budget measure include $4.1 billion in federal funds and block grants, $1.5 billion in agency generated monies known as special revenue, nearly $1.2 billion from fuel taxes and other sources reserved for road needs, and $408 million from lottery proceeds. Surplus-supplied funding totals $50 million. With the budget bill now on his desk, the Governor has until Tuesday to exercise the authority of the line item veto. The 2014 Fiscal Year budget takes effect July 1 of 2013 through June 30th, 2014. The Legislature has completed much anticipated legislation that allows Monongalia County to establish a sales tax increment financing (TIF) district for the University Town Centre in Morgantown. The TIF will freeze the sales tax in the area at their current rate. It then allows the county to use the funds from future economic growth in the district to pay down bond debt incurred to build this initial infrastructure. This is the final step in a $96 million development project that will include an exit off Interstate 79 between Westover and Star City, and development of a $16.2 million ballpark for the West Virginia University baseball team. The project is also expected to free up 1,400 acres for development of retail stores , office space and light industrial facilities on each side of the interstate. A New York-Penn League short season A ball team will share the ballpark with WVU along with small colleges from around the area and likely high school teams. Work on the new ballpark is expected to start in 2014. According to various realty companies, more than 60 percent of the development on each side of the Interstate is already committed. The Morgantown project is expected to create an estimated 1,100 construction jobs and as many as 1,500 permanent jobs. House Bill 103 will provide the distribution of certain state funds to volunteer fire departments under a Volunteer Fire Department Workers Compensation Subsidy Program. This will allow for the funding of Volunteer Fire Departments to insure they have sufficient funds to operate properly. Senate Bill 1003 immediately increases salaries of those magistrates and their staffs whose salaries were reduced as a result of the 2010 census to pre-census amounts. The bill also requires the Joint Committee on Government and Finance to request a study by the National Center for State Courts on the weighted caseload, salaries, jurisdiction, and apportionment of the magistrate court system. Senate Bill 1005 will transfer funds into the un-appropriated surplus balance in the state fund, general revenue, and to supplement, amend, and increase existing items. The bill adds new items of appropriation in government accounts for spending during the fiscal year 2013. At the conclusion of the 2013 Regular Session, the West Virginia Legislature introduced 1,829 (1,164 House Bills, 665 Senate Bills) total bills and passed 216 (110 House Bills, 106 Senate Bills) of them. Senate Bill 22 will require health insurers to cover maternity services for all individuals who are participating in or receiving coverage under a policyholder’s health insurance plan if those services are covered under the policy. This is expected to ease the financial burden on new mothers who are covered under a policy’s health insurance plan. Senate Bill 103 will create the West Virginia Commuter Rail Access Act. The act would allow for the state to enter into agreements with other states to provide commuter rail operation in when those states where commuter rail operation is already present. This could potentially give more out of state access to residents and could increase the number of people utilizing alternate transportation other than cars. Senate Bill 108 creates an Unintentional Pharmaceutical Drug Overdose Fatality Review Team in Chief Medical Examiner’s office. It requires the Team to investigate all deaths due to unintentional prescription or pharmaceutical drug overdoses. Deaths of persons by suicide or those suffering from a mortal disease are excluded. Senate Bill 185 relates to the tax credit for alternative-fuel motor vehicles and related refueling infrastructure. Current law provides a tax credit for persons and companies for alternative-fuel motor vehicles, including natural gas, fuel mixtures containing at least 85% alcohol, and electric. With the implementation of this bill, people purchasing only natural gas and liquefied petroleum gas fueled vehicles will receive a tax credit. Senate Bill 202 will create the West Virginia Spay Neuter Assistance Program and Fund. This will give nonprofit programs the funds to be able to take care of pets whose owners may not have the financial means to properly do so. Senate Bill 437 relates to commercial dog breeding and contains a list of requirements for how a commercial breeder, one who breeds dogs solely to be house pets, must keep and maintain the dogs, including that dogs must be housed in shelters that protect them from the elements, be provided clean food and water, adequate medical care and current rabies vaccinations. Senate Bill 464 would regulate tanning facilities and establish criminal penalties for violations. This bill would require that owners of tanning facilities must have a West Virginia business registration certificate, and register with the local board of health on and after July 1, 2014. It also states that anyone under the age of 18 is prohibited of using tanning devices. Senate Bill 470 permit farm wineries and licensed wineries to sell samples of wine and wine during fairs or festivals and on Sunday mornings of those events. Samples would no exceed three ounces. Consumption would be allowed on the premises of these fair and festivities except from 2 a.m. and 10 a.m. on Sundays. Senate Bill 481 would amend and clarify a number of provisions related to the process for voluntary commitment and transport of juveniles in need of mental health or addiction treatment. This bill states that minor must be admitted by an involuntary admission if an application for involuntary admission of a minor is not submitted by a parent/guardian or by an emancipated minor. Senate Bill 652 would provide for criminal background checks for home inspector applicants. It would require for State Fire Commissioners to propose rules requiring applicants for home inspector licensing, registration, or certification to submit to a state and national criminal history record check. House Bill 2351 authorizes officers to arrest a citizen driving on a revoked/suspended license and present that person to a magistrate. The bill also establishes that the arresting officer may issue a citation in lieu of presentment to a magistrate if a magistrate is not reasonably available. House Bill 2395 makes it mandatory for in-home care workers to obtain and pay for a state or federal criminal background check. The bill removes the requirement to note an in-home care worker’s criminal history on the registry. House Bill 2453, also known as “Skylar’s Law,” expands the Amber Alert Plan. Previously, the plan only included abducted children. Skylar’s Law activates Amber Alerts for children who are believed to be missing. House Bill 2471 clarifies that a person who’s in lawful possession of a firearm cannot be restricted or required to re-register his or her weapons in the instance of a declared state of emergency. The bill also clarifies the requirements for firearms and ammunition use and sale during a declared state of emergency. House Bill 2487 effectively bans the use of laetrile as an alternative cancer treatment. According to The American Cancer Association, laetrile is a chemically modified form of amygdalin, a naturally-occurring substance found mainly in the kernels of apricots, peaches, and almonds. It also contains a small amount of a substance that can be converted to cyanide in the body, and several cases of cyanide poisoning have been linked to the use of laetrile. House Bill 2548 increases the penalty for a person who commits an assault on an athletic official while they are serving in an official capacity from jail confinement of between 24 hours to 30 days to between 5 days to 6 months. The fine remains the same, at $50 to $100. House Bill 2579 creates a new water quality standard and makes it mandatory for coal companies to begin monitoring impacts to fish populations if they exceed the level of selenium allowed in this new water quality standard. The monitoring results will be reported to the DEP for future use as a selenium state-specific standard. House Bill 2747 will amend the way state agencies must report their public meetings. This bill will now require state agencies to file notices electronically on the Secretary of State website as opposed to filing it in the State Register. Agencies must also post these notices five days before the meeting unless it is considered an emergency. House Bill 2814 will make multiple changes to the definitions of human trafficking in the state code. The bill changes the definition of “human trafficking” to take out the current section that states there must be at least three or more victims to qualify as “human trafficking.” Also, the bill would exempt those who were victims of human trafficking from prostitution charges. House Bill 3020 will create the “Michael Cunningham Act.” The bill defines definitions of terms relating to boat docks and marinas. Additionally, signs warning of electrical shock and telling swimmers not to swim within 100 yards of the dock will be required to be posted. 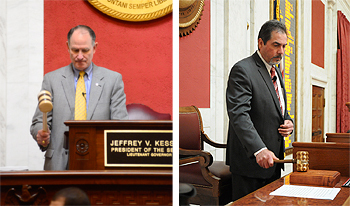 Senate President Jeff Kessler and House Speaker Rick Thompson both strike the gavel in their respective chambers - signaling the end of the 2013 Regular Session.